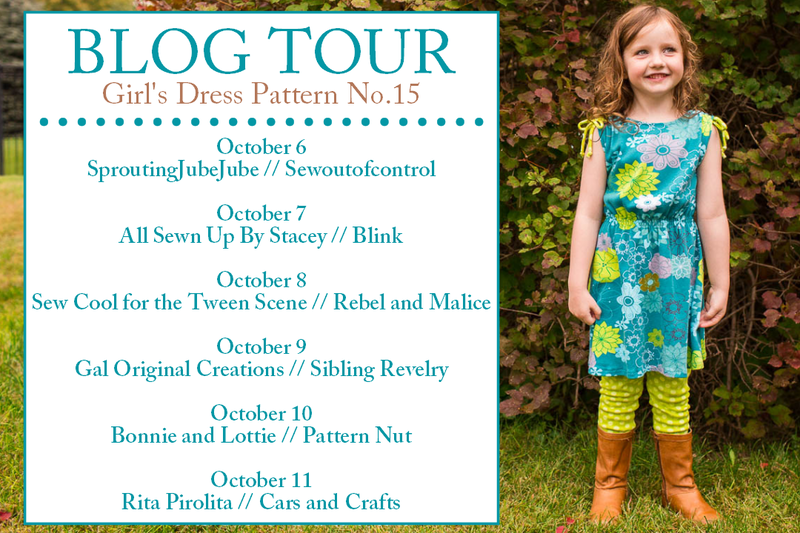 So the patterns are coming thick and fast from Allison at E+M Patterns - and yet again she has produced a beautiful and stylish dress pattern that is also practical - and I am happy to be a part of the blog tour for this dress!! Allison always puts in a great deal of work and attention to detail into her pattern tests - and this means the results are always perfect!! This dress is great for everyday wear and nursery! The pattern talks you through the nice neat seam finishes E+M Patterns are known for, as well as some techniques to get the best from your fabric and how to get the lovely shirring detail for the waist, and this will ensure a great, professional results every time! I tried out the two different hem options for this pattern - the orange dress above has the straight hem (I shortened the length a little for this one because I intend for Little B to wear it with leggings as we come into the colder weather) - and below - the geometric dress has the beautiful asymmetric hem. The shoulders on this dress are also quite flexible - you could tie the bows tight on warmer days to ruche the fabric up and leave the arms uncovered or if it's a little cooler you can loosen the bows and let the fabric hang down onto the upper arms a bit more. As always, a beautiful pattern and a beautiful result! For the duration of the blog tour you can get this pattern for just $5 using the code TOUR15 - such a bargain!! And don't forget to enter the giveaway - up for grabs is this pattern AND any other pattern of your choice from the E+M Patterns shop!! Here is a link to the rafflecopter, and if you comment on all the blogs you will earn extra entries - so check out all these other lovely ladies over the next week! So cute, I love the orange one on her! Orange one is adorable! And the tribal one was cut out perfectly!